Space Police 1 Mission Commander/Galactic Enforcer. 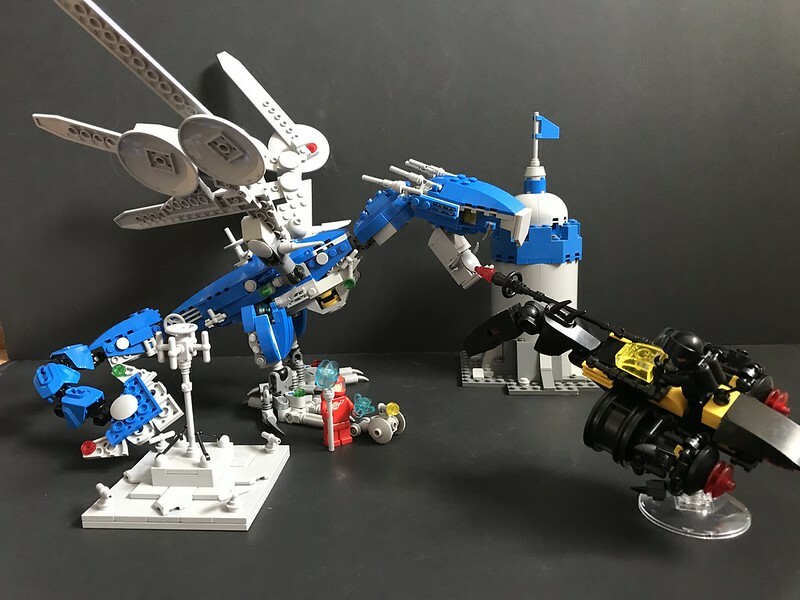 Photo from Jangbricks. 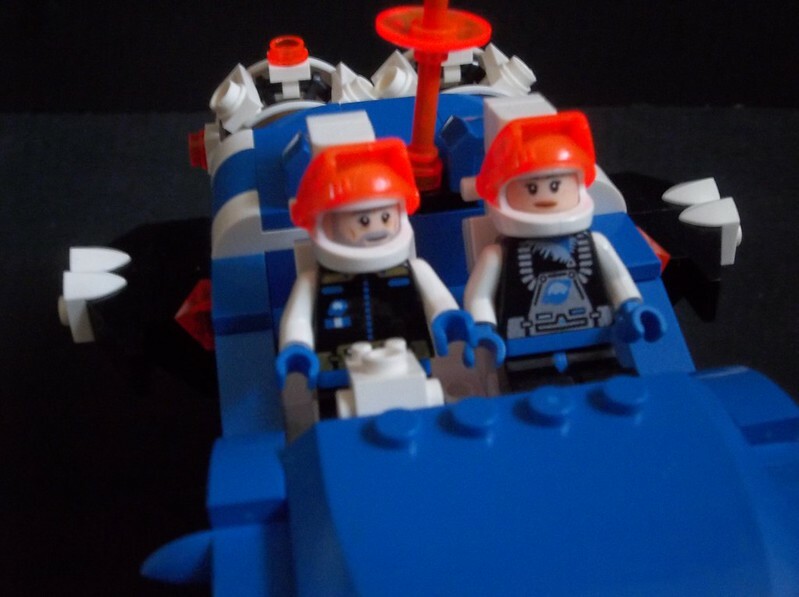 It took me a while to make my peace with the idea of the Space Police, and to this day only Spyrius and M:Tron among the early (pre-UFO) LEGO Space themes have inspired fewer builds. 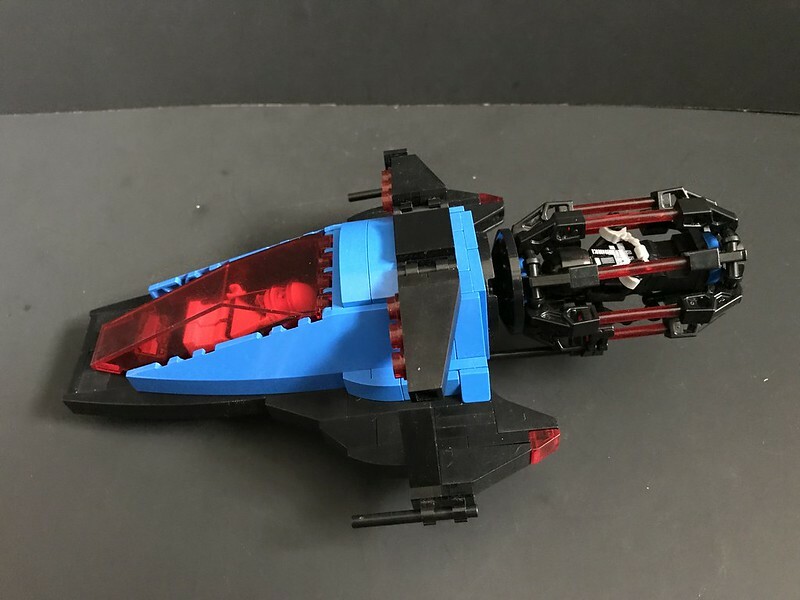 The first Space Police sets came in just as I was entering my personal Dark Ages, and while the Blacktron subtheme provoked admiration laced with confusion (who exactly were these dark knights of the spaceways? ), the Space Police line provoked more of a confusion-laced disdain. 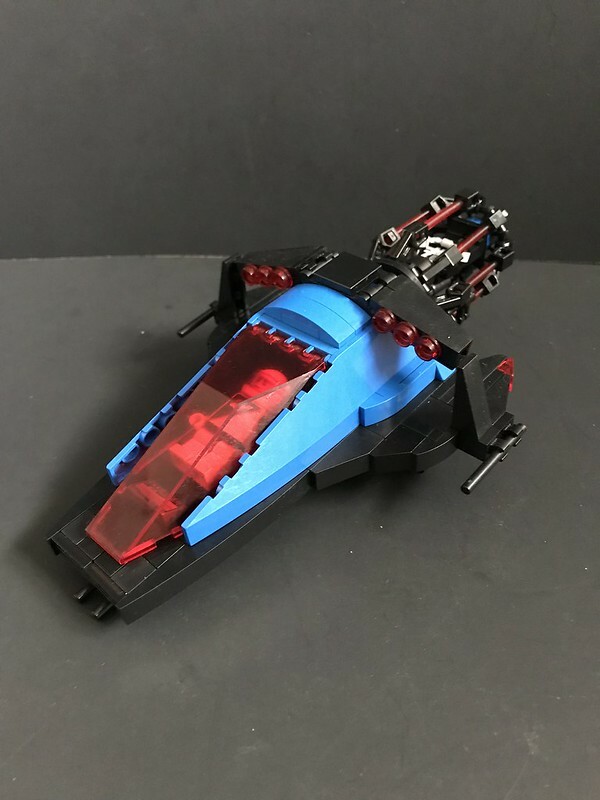 At the time, I managed to completely miss the fact that those were Blacktron astronauts in the cells, that this was the first factional conflict in LEGO history, and I wasn’t thrilled with the idea of a spacegoing police force. If I’d wanted to play cops and robbers with my LEGO, I’d have been into Town sets. 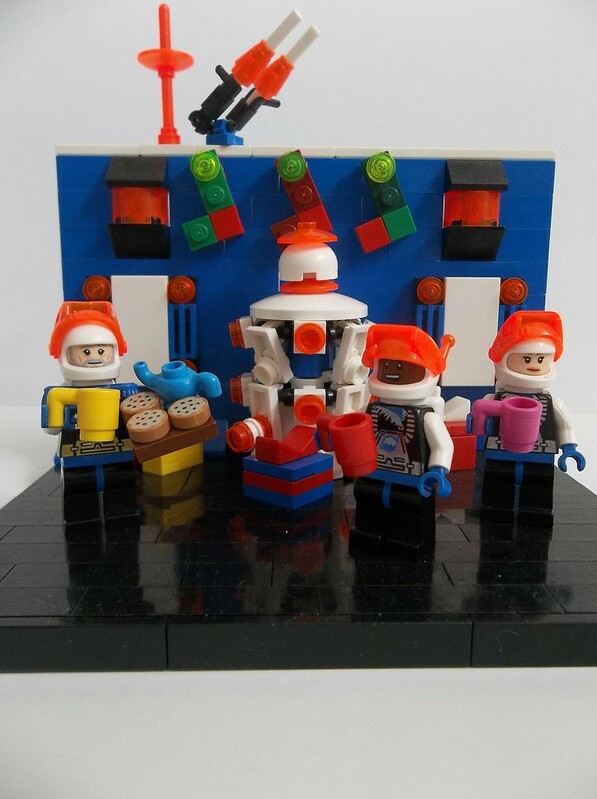 What did they think they were doing, mucking up my beloved Space theme and turning it into a Town clone? 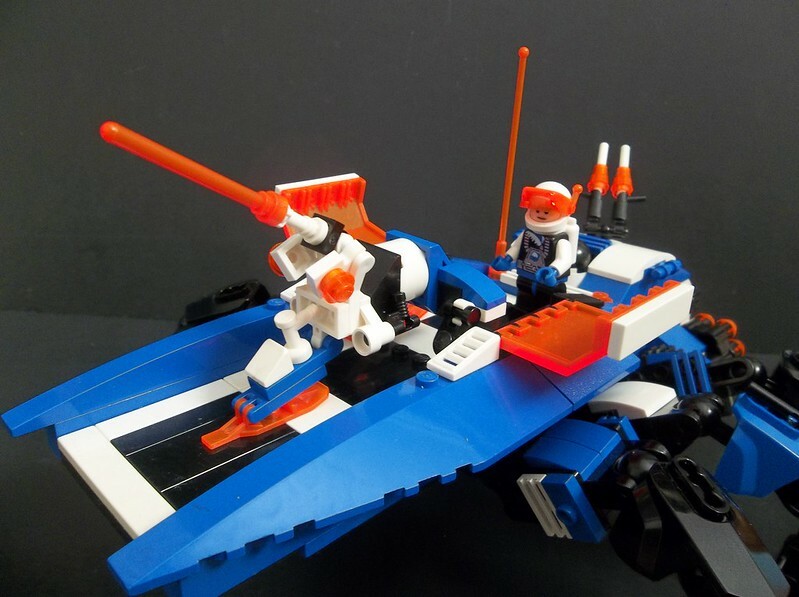 Space Police? Bah! 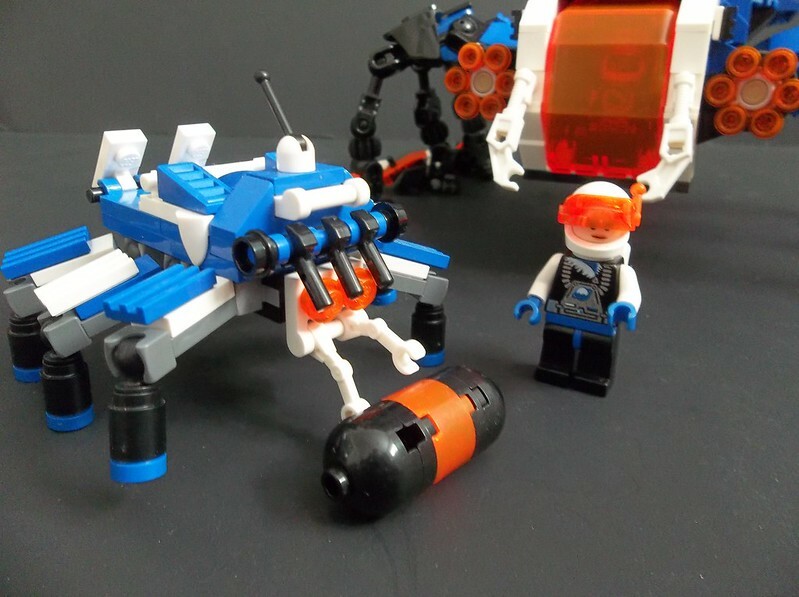 Coming back to LEGO a few years ago, it still took me a while to get past my youthful hangups. I had remembered the second-generation Space Police’s unattractive grey livery colours as belonging to Space Police I, and I couldn’t for the life of me imagine why such an unpromising-seeming subtheme should have spawned not one, but two iterations, especially when the awesome Ice Planet subtheme (which I do remember with fondness even though it happened in my Dark Ages) only got a single run of sets. 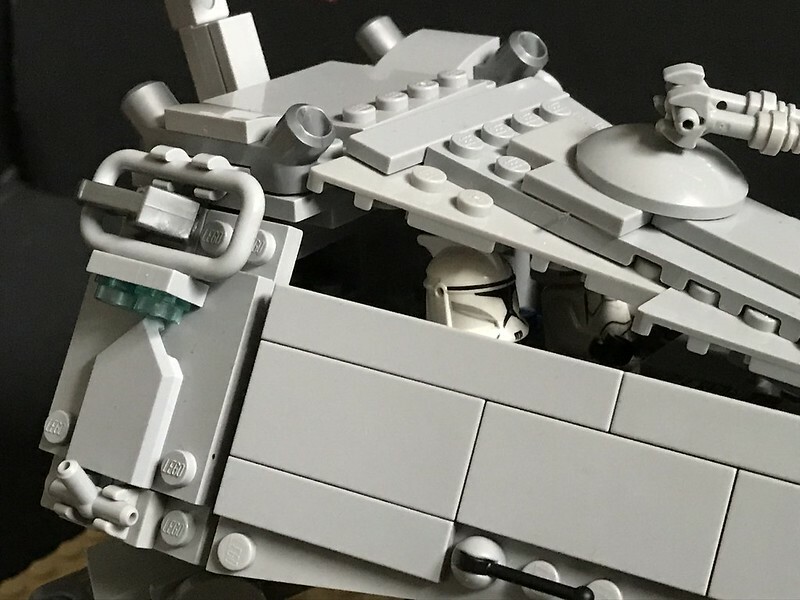 I know better now, but only having acquired a Space Police trooper relatively recently I haven’t done much with them in the way of building. 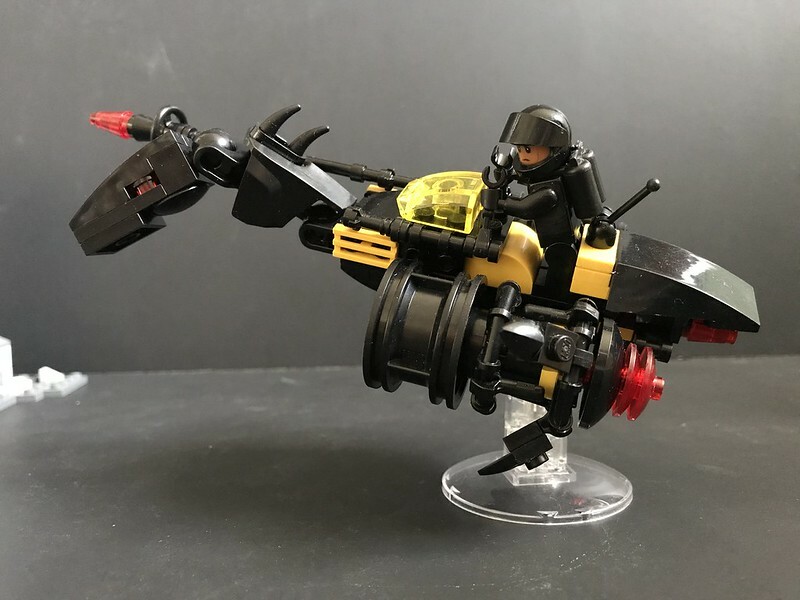 This, then is only my third or fourth Space Police build at all, and of course I’m gravitating to SP1, just as I prefer my Blacktrons to be first-generation rather than “Future Generation” Blacktron IIs. 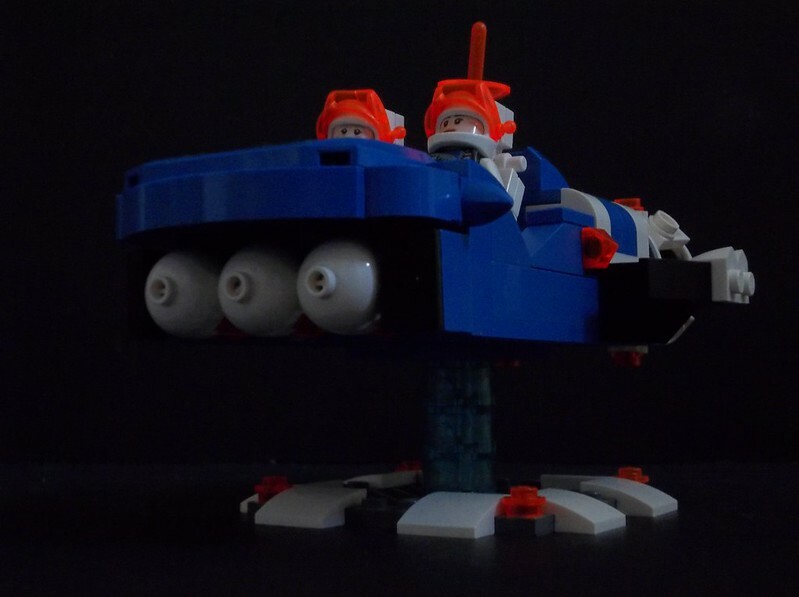 Given my penchant for inverting the moral polarity of the Classic Space universe – Blacktrons are the good guys of the rebel alliance, while the Classic Space/Futuron/Space Police triumvirate represents an oppressive, totalitarian System – SP1 colours have the most sinister appearance. 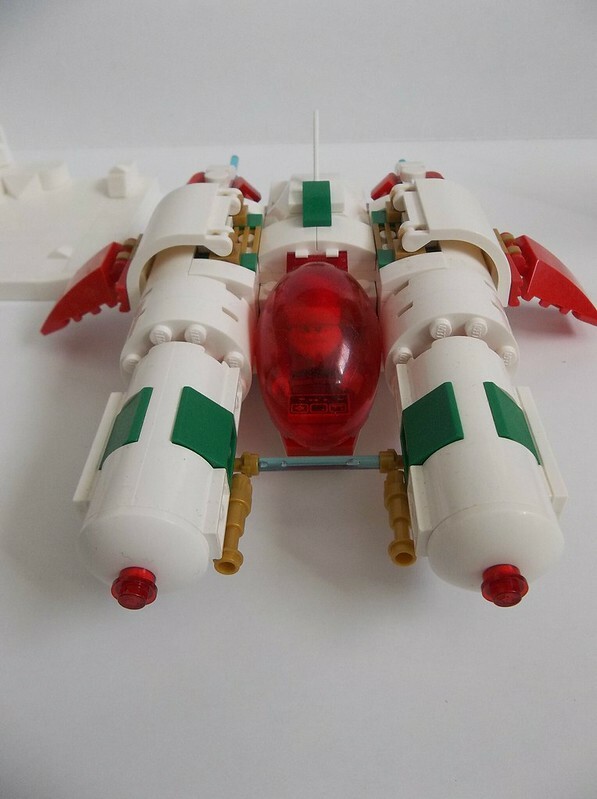 Though conceived and built as an update to the Space Police Striker, it’s a little smaller and doesn’t incorporate the light-up features of the original. 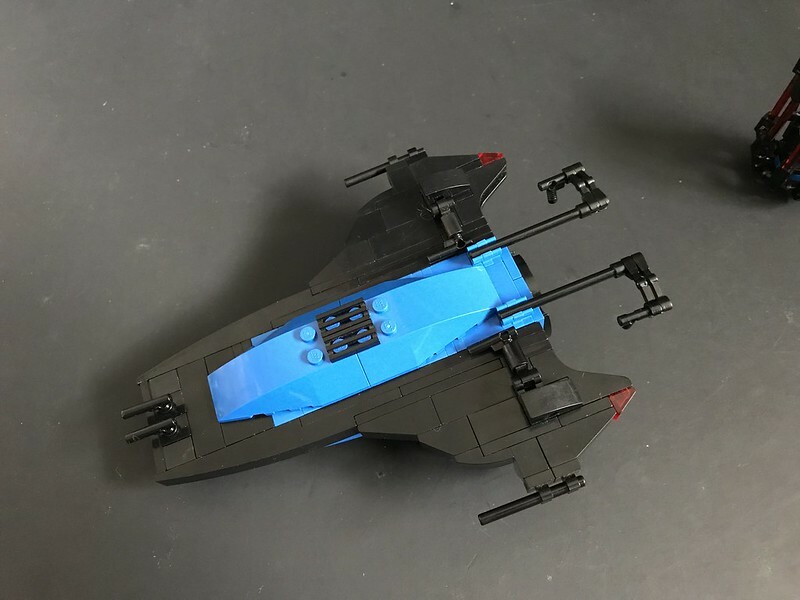 In fact, it’s closer in size to the much smaller Galactic Peacekeeper, though its configuration is more like the Striker. I’m calling it the “Stinger”. 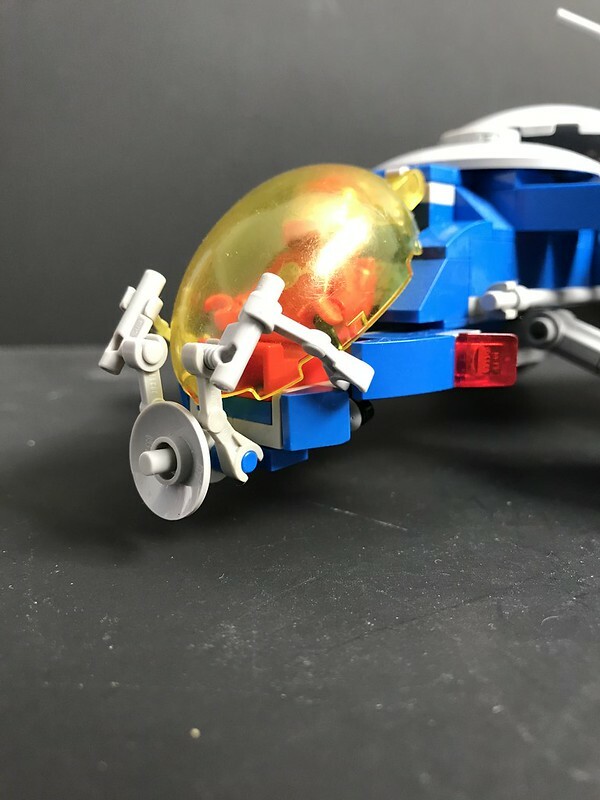 My prisoner transport pod design is far more cagelike than the original SP1 pod. I’m afraid I went rather overboard with the laser bars concept of the original, which it must be said are way cooler than the SP2’s pods managed. I’d have liked something a little more like the tubular pods of SP3 (though in red), but I don’t have any of those half-cylinder elements in trans red. What I’ve ended up with looks vaguely Mediaeval. 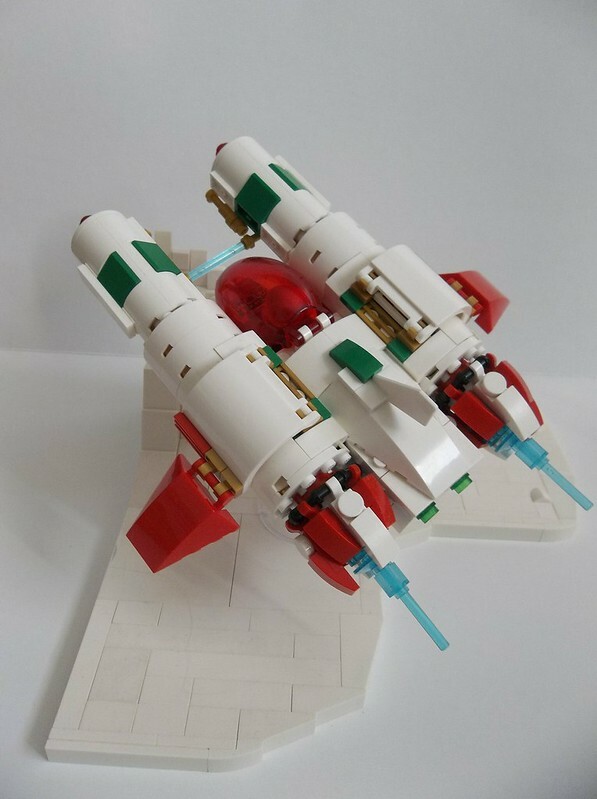 Still, it works, and I have to say that the way those cylindrical pods were attached to SP3’s Galactic Enforcer was ugly. 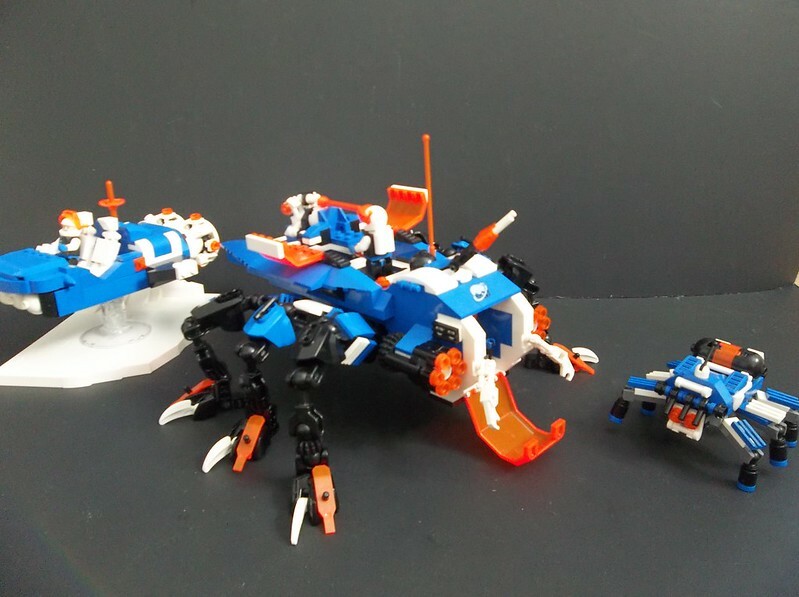 The Stinger is presumably something like an extended-range Galactic Peacekeeper or smaller and more agile Striker. 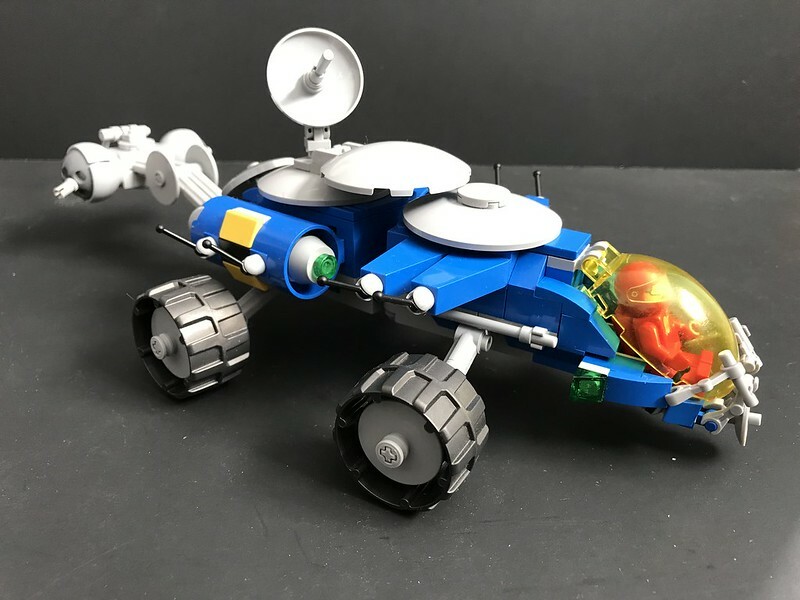 Perfect for chasing those dastardly Blacktrons all over the cosmos. 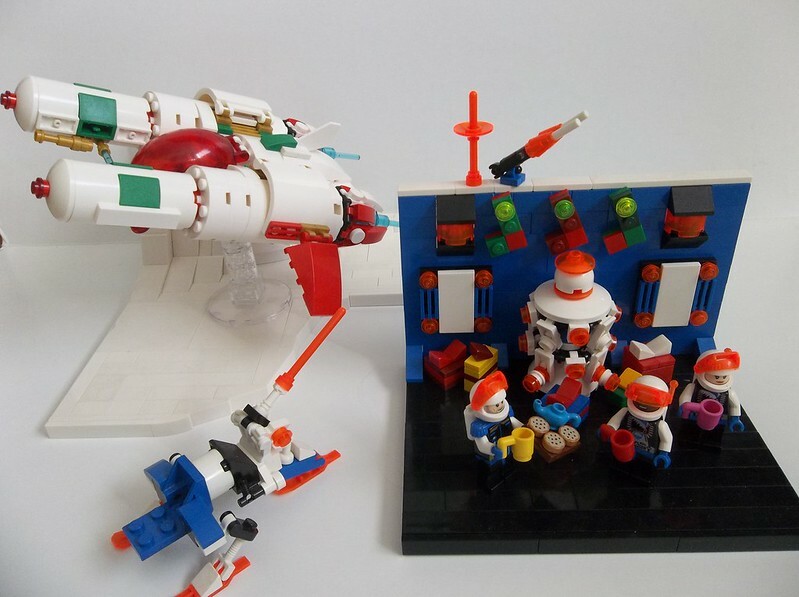 This entry was posted in Lego Classic Space, Lego Space, LEGO Space Police and tagged Lego, MOC, Neoclassic Space, Space Police, Spaceship, The System on April 11, 2019 by geoffhorswood. Horizon Station is the main Federation outpost on Eos, third planet of the star 51 Arietis. The star system contains no habitable, Earthlike planets, but its location makes it an emerging nodal system for the exploration of the Sancerre sector. 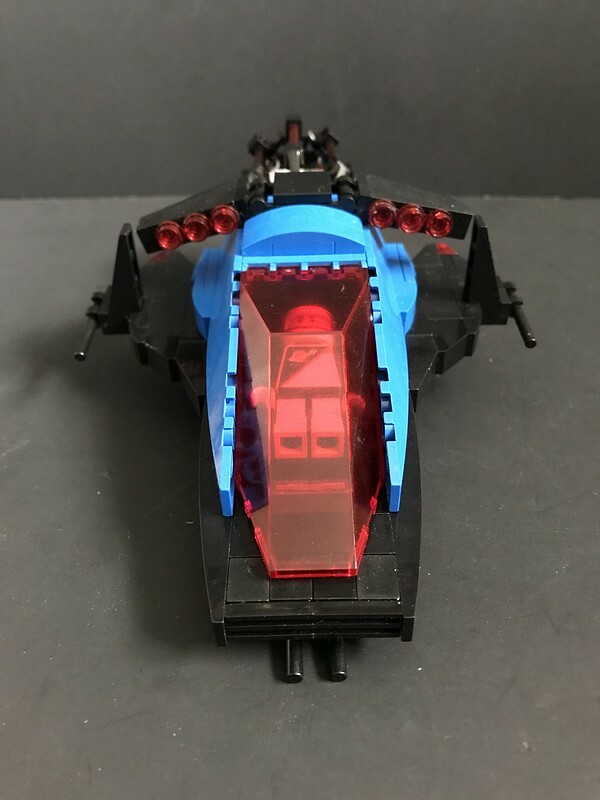 Due to a strong Blacktron presence in the neighbouring Inari sector, Horizon Station’s defences have been enhanced over what might be expected from what is still a relatively minor exploration hub, as attested by the presence of a full-blown Protector-class surface-based anti-capital-ship laser turret. Federation heavy transport Altair (hull no. LL828) sits on the landing strip adjacent to the Protector turret. A Starlifter-class vessel built for the intrasystem transport of cargo rather than passengers, Altair’s blocky lines are less elegant than more passenger-optimised transports such as LL928 Galaxy Explorer. Warehousing on the other side of the landing strip serve as a holding area for transfers of cargo into and out of the Station. The plasma exhaust vents jutting upward in front of the turret are from an old subterranean fusion plant, now part of the emergency backup systems. 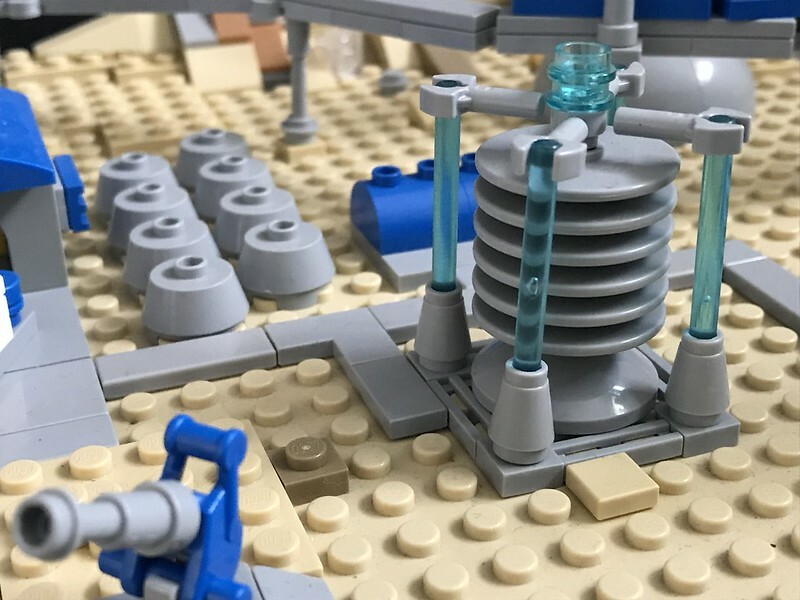 The modern plug-in antimatter reactor that actually powers the base is located some distance from the main facility for safety reasons. Controlled antimatter annihilation produces vast amounts of energy, and should the containment fields fail, this energy would be released all at once with incredible violence. A newly-built monorail track connects the turretside landing strip to other parts of the Station, passing on of Horizon Station’s sensor nodes on its way out. 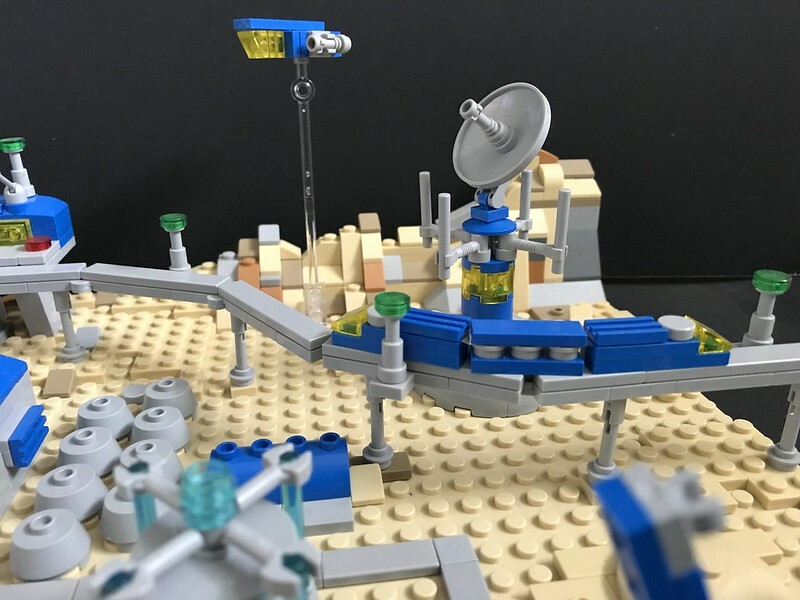 The various active and passive radars, gravitic detectors, advanced optics, life sensors and lidar on the planetary surface and in orbit are tied into a single network in order to maximise the sensitivity and resolution of the system. On the other side of the elevated monorail rack is an old-style rocket launch pad. Even in the age of antimatter annihilation reactors and cheap fusion, old-fashioned rocketry still has its uses: re-usable nuclear and chemical rockets are a low-tech, low-infrastructure way of achieving orbit without needing complex and costly megastructures like orbital rings and space elevators. 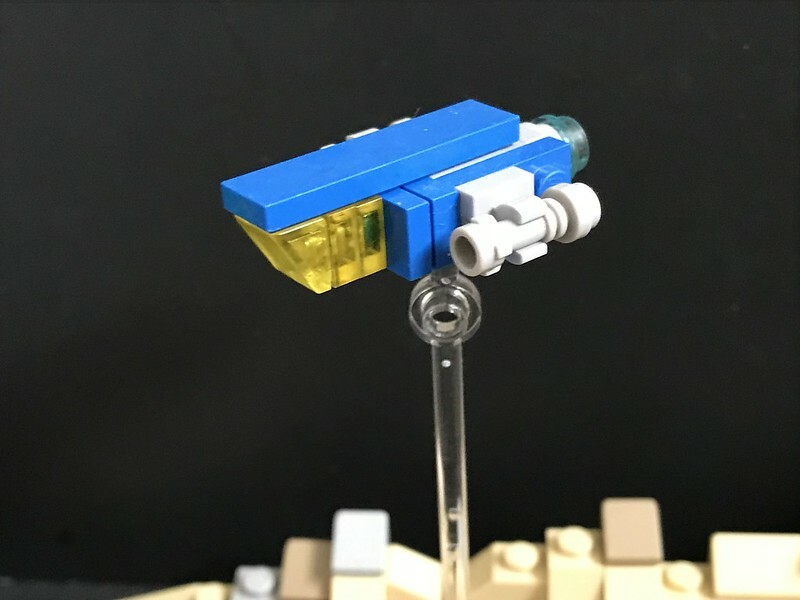 The fast transport LL564 Hyperion swoops in over the Protector-class turret for a landing on the strip, while the compact Eridani-class scout cruiser LL667 Galbatorix hovers over the ridgeline in a holding pattern. 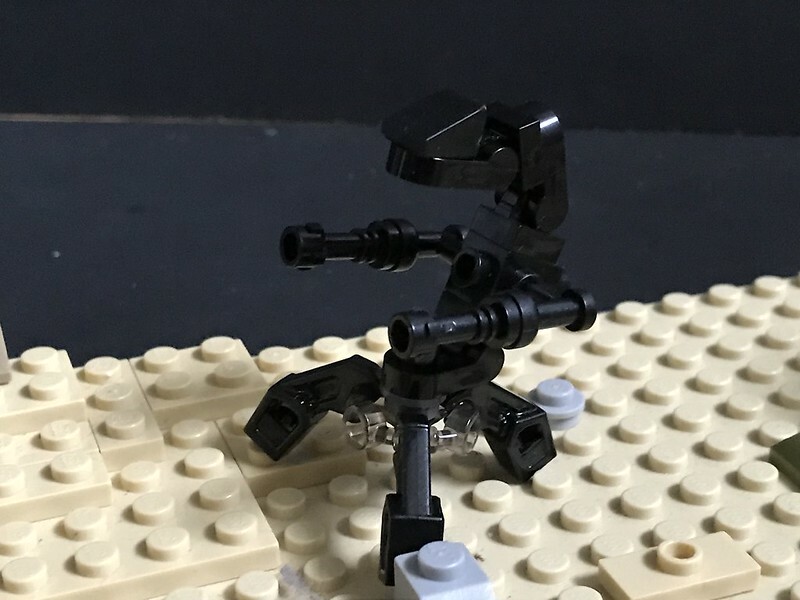 Microscale is great for stuff like this. 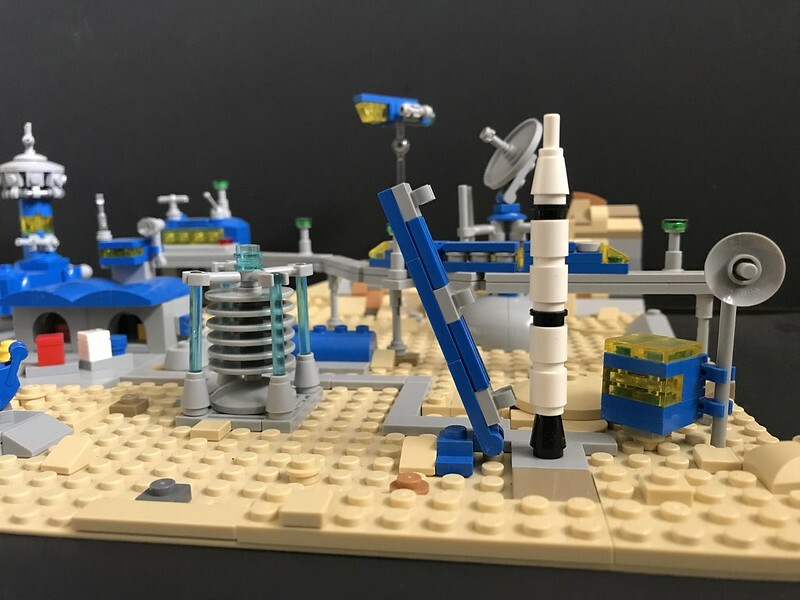 While it would undoubtedly be awesome to be able to put something like this together in all-up minifig scale, my brick inventory isn’t yet up to humungous double-pool-table-sized displays. 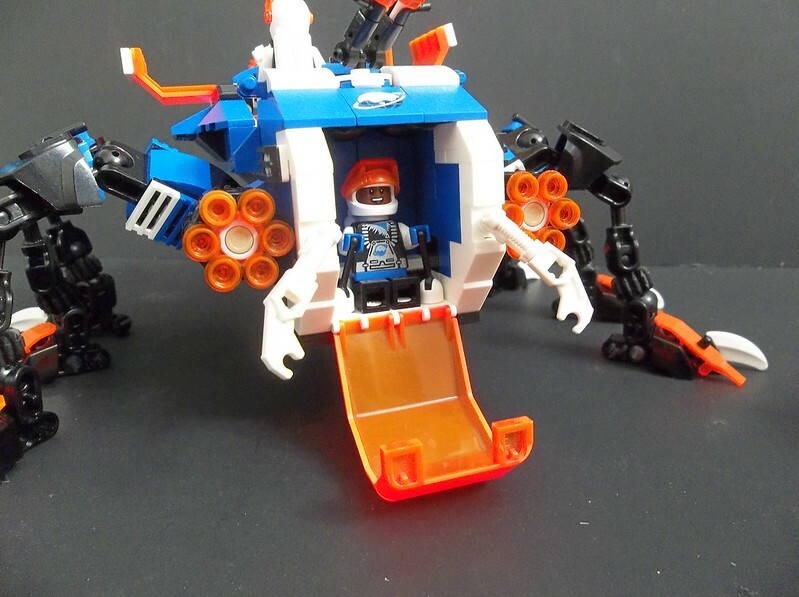 Also, I’m not certain how I’d do that defence turret in minifigure scale. The turret was the first piece of this to get built, and the base grew up around it. I was playing around with various dome designs, and realising that I still don’t have quite enough 1×4 hinge plates for a ¾ icosahedron dome in all light bluish grey, and came up with this alternate dome design using the nexagon plates. 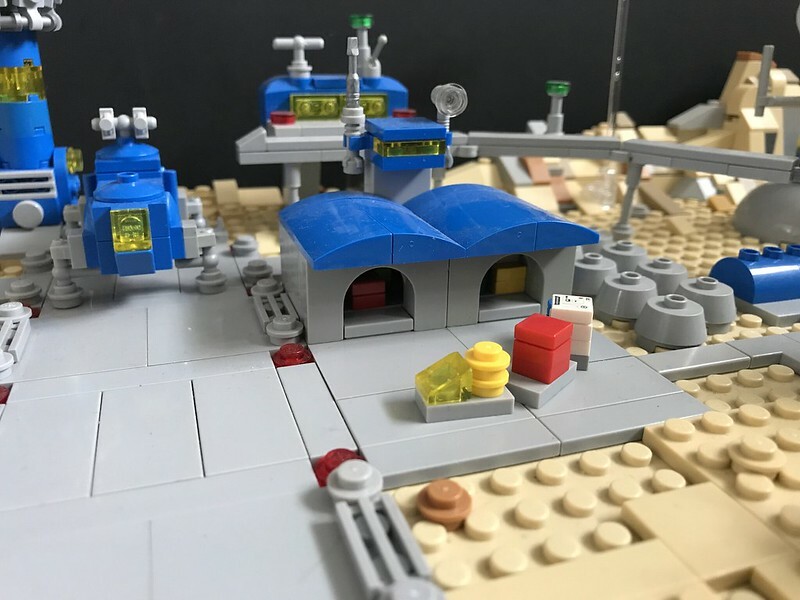 This meant that the minifigure-scale greenhouse dome I was contemplating got quietly reworked into a defence turret, and then I added the landing strip and LL828 Altair. Then the rest of the base happened. It took some time to put together, as I put things in, moved them around, reworked them and even took them out again completely. 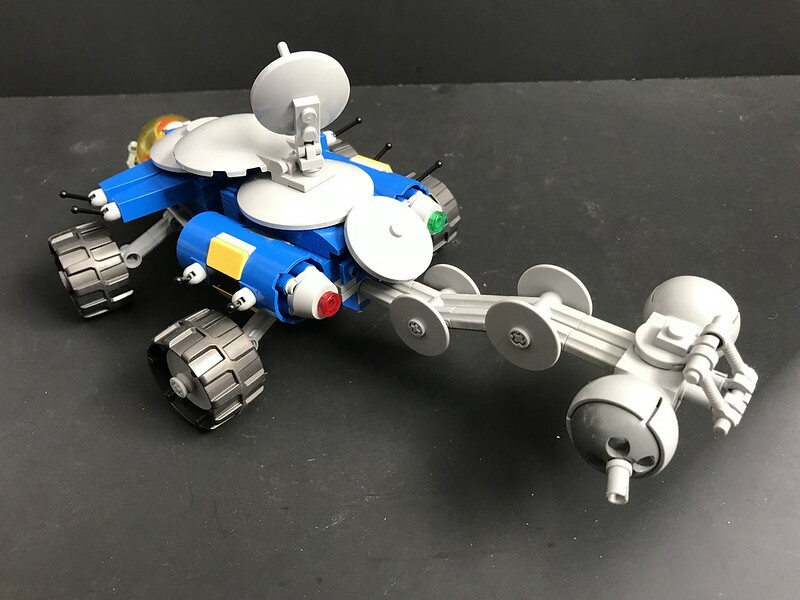 I’m quite pleased that I managed to reference the authentic Classic Space red hubcaps in a microscale surface rover, and I also managed to reference the Space monorail and the Alpha-1 Rocket Base. 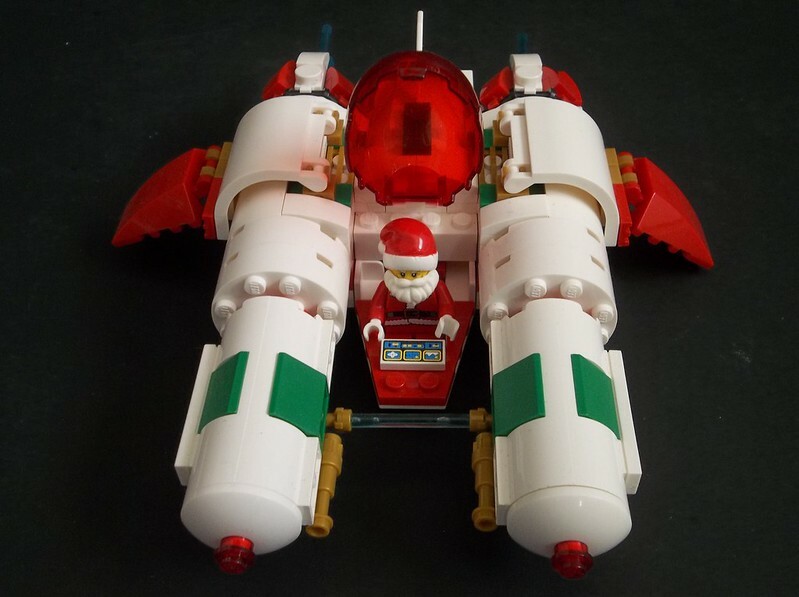 For the record, LL828 Altair is named after the brightest star in the constellation of Aquila, the eagle, because it has a definite resemblance to the Eagle spacecraft from the old Space:1999 TV series. 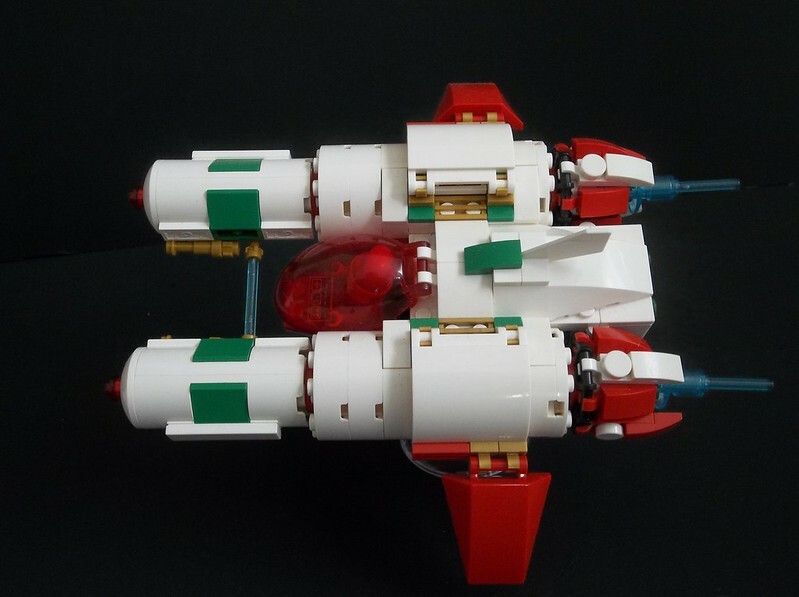 The Eagle’s a great design and looks very adaptable to the near-future semi-realism of the Classic Space theme. 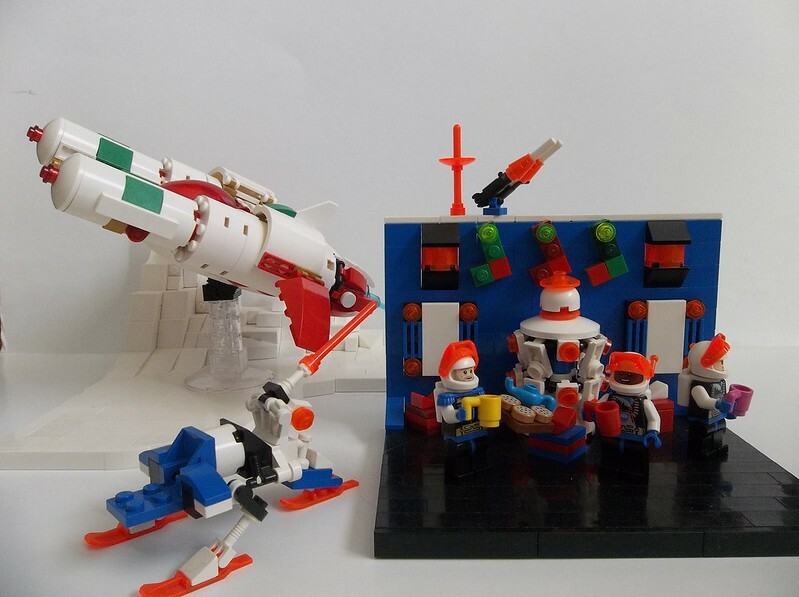 At some point I have plans to build a full-sized minifig-scale Altair. Horizon Station itself (I tried out various names before settling on this one) is named because I wanted something forward-looking and optimistic in keeping with the original spirit of Classic Space. Also it doesn’t necessarily tie you down to any particular location or franchise universe. The terrain of planet Eos (named after the Greek goddess of the dawn, because Classic Space just seems to go with Greco-Roman mythological names) is light tan because that’s the colour of baseplate I have, but it also looks pleasingly like the sand-coloured planetary backdrop featured in all the old Classic Space promotional materials, like catalogue imagery and instruction booklets. 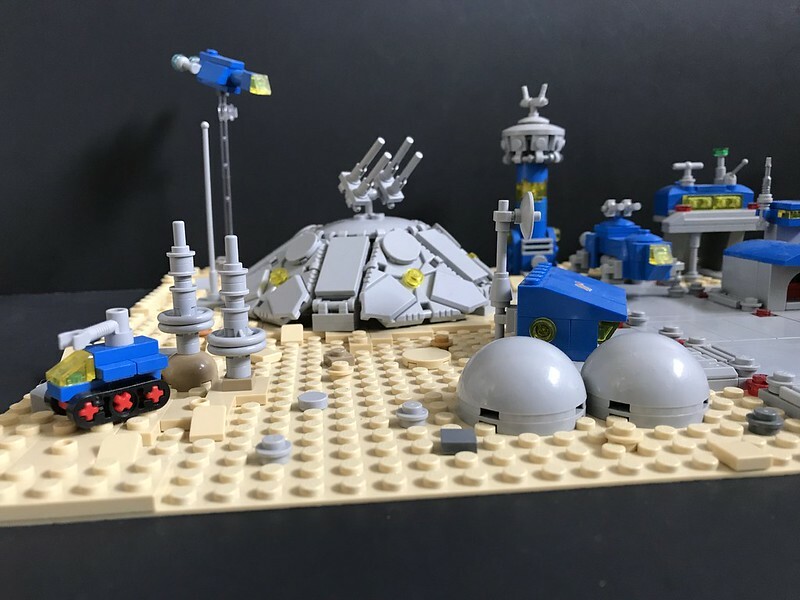 I always used to wonder how the sand/tan background was supposed to represent the same planet as the old grey crater baseplates anyway, so being able to just build my planet in one colour makes sense to me. 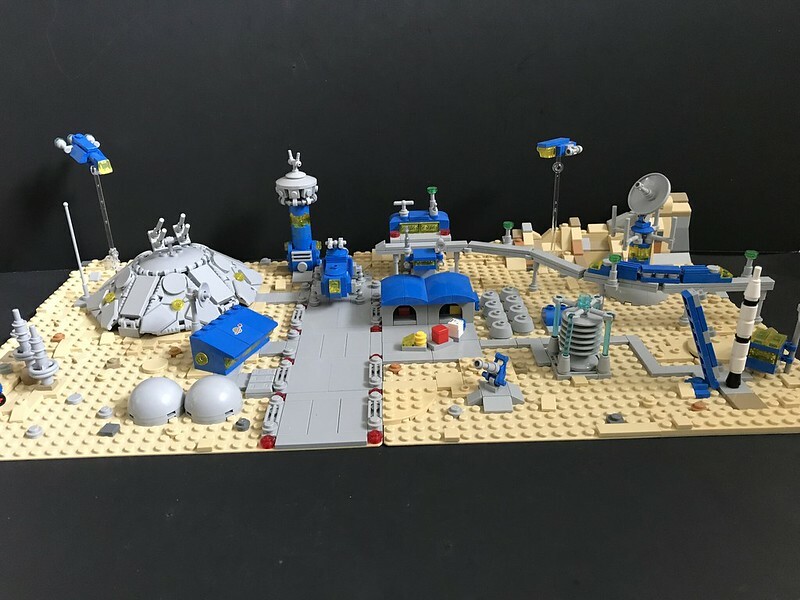 This entry was posted in Lego Classic Space, Lego Space, Microscale and tagged Classic Space, Lego, Microscale, MOC, Moonbase, Neoclassic Space, Space Base, Space models on April 3, 2019 by geoffhorswood. 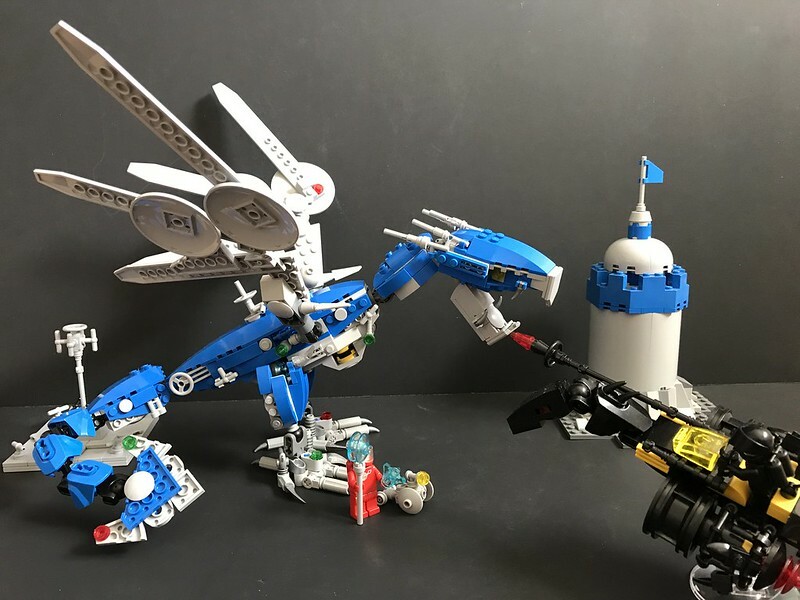 Combining dinosaurs and space is a long-standing LEGO tradition for my AFOL self. Ever since I allowed myself to get back into building I’ve had a bit of a thing for merging the future and prehistoric realms. 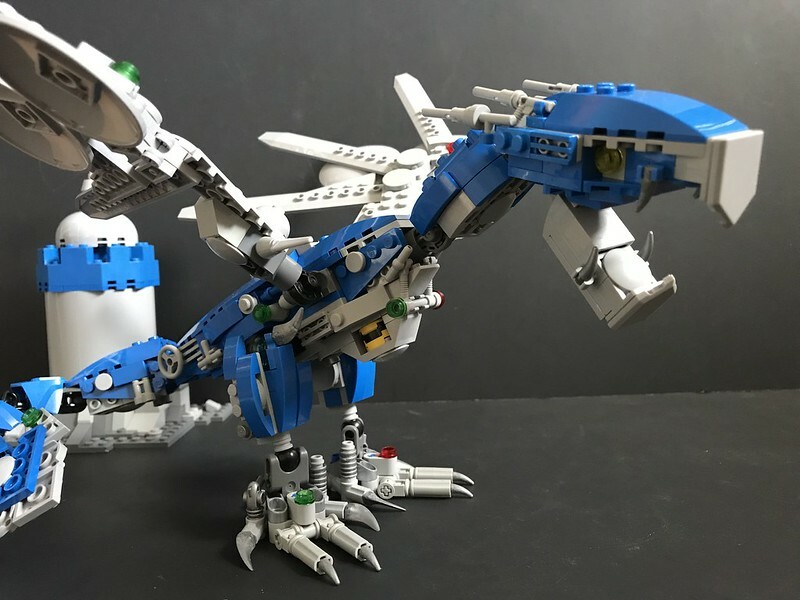 My username on the old LEGO.com forums – SaurianSpacer – referred to this; I knew I was going to be Building A Spaceship a lot, but my first posted creation was a Quetzalcoatlus pterosaur. And then some of my first (digital) AFOL creations were a series of dinosaur-shaped spaceships and vehicles. But I don’t think I’ve done an Ankylosaur before. It’s a strange omission in some ways. Ankylosaurs were one of the major dinosaur families, and the armoured beasts were and are pretty cool. So as the first instalment of FebRovery 2019 I decided to rectify the situation. 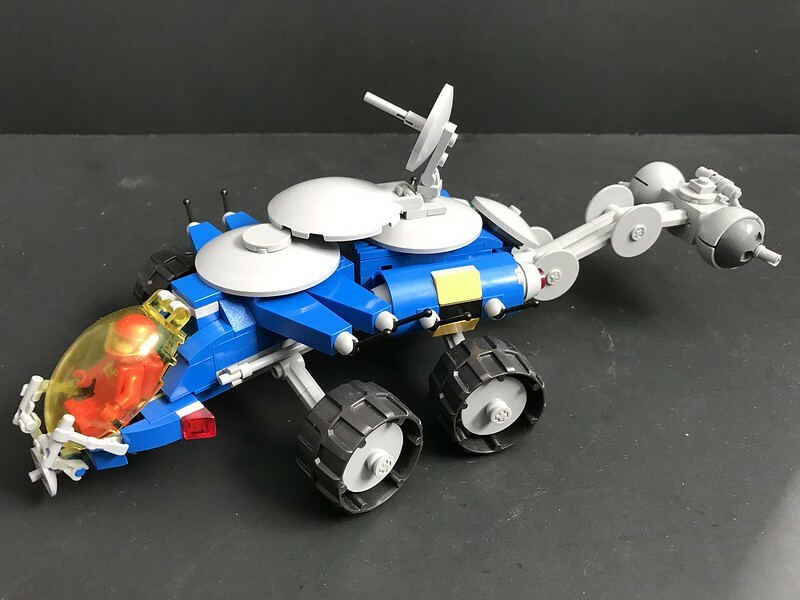 Role-wise I think the Ankyloroversaurus is some sort of geo-sensing rover, possibly akin to 6841 Mineral Detector or 6844 Seismologic Vehicle. All the bristly antennas along the sides look like they’re part of some kind of sensing equipment, like an advanced Ground Penetrating Radar array or similar. 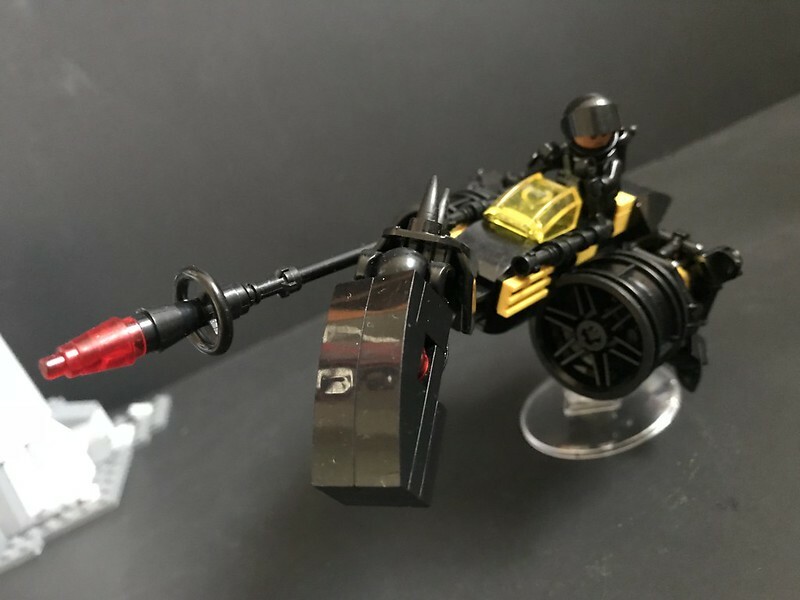 The cannon-armed thagomizer is possibly a little out of place on a geo-sensing vehicle, but in real Classic Space those wouldn’t actually be cannons despite what they look like. No, they’d be rock sampling lasers or the nodes of some other kind of sensor (using gamma rays?). Of course, possibly those spikes along the sides aren’t antennas, and the vehicle has a more military nature. That seems a little less likely given the prominent non-existence of weaponry other than the tail club, but perhaps a force-shield generator rover or similar? That’s actually a pretty good idea and goes well with Ankylosaurus’ armoured nature. 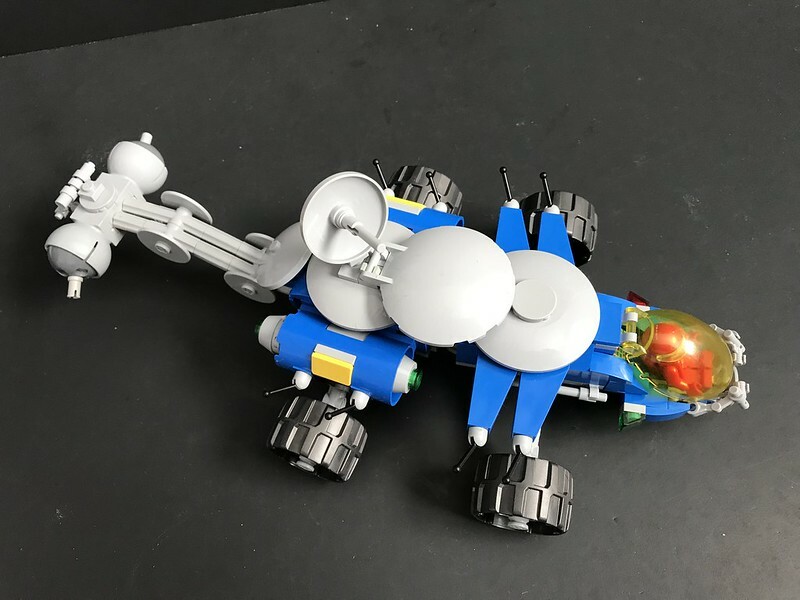 But it still looks a lot like a geosensor rover to me. 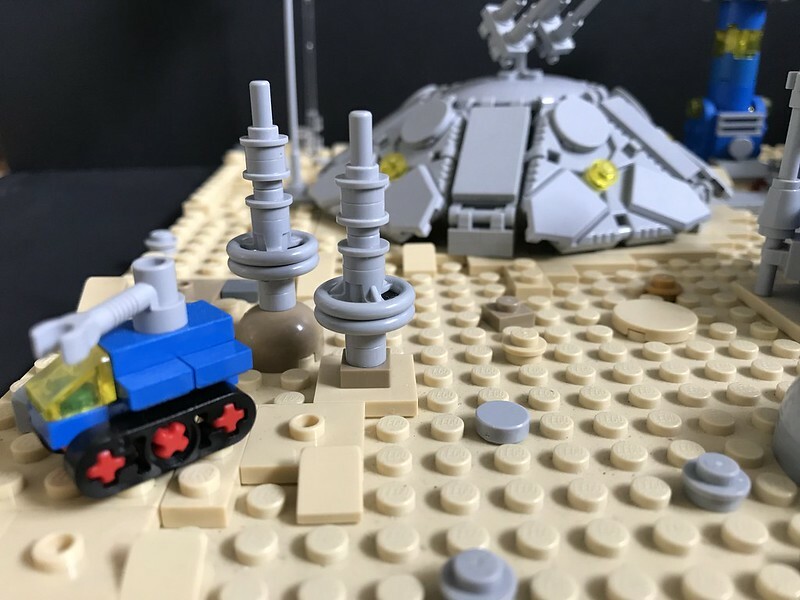 This entry was posted in Lego Classic Space, Lego Space, Prehistoric beasts, Space Rovers and tagged Ankylosaurus, Dinosaur, Lego, Lego Space, MOC, Neoclassic Space, Space Rover on February 6, 2019 by geoffhorswood. 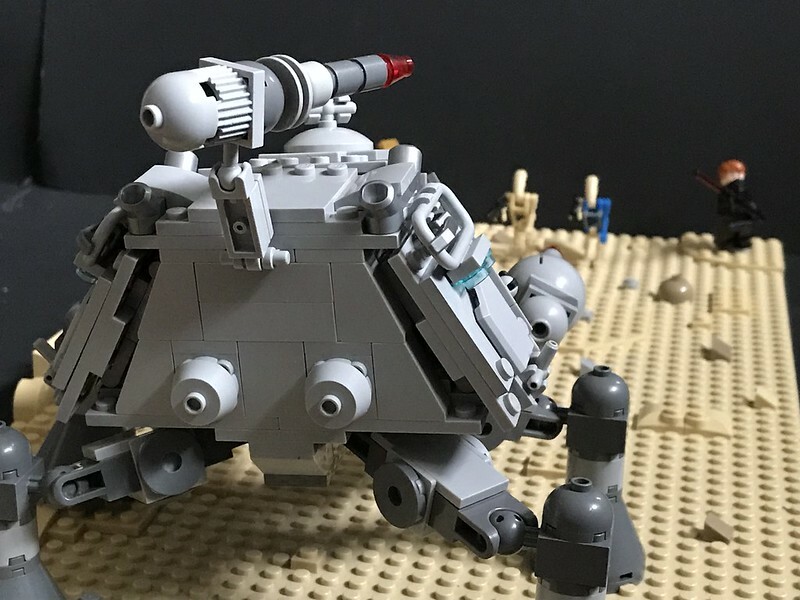 The All Terrain Medium Enforcer (AT-ME) was a Clone Wars-era armoured walker of the Galactic Republic, sometimes called the “Clone Battlecrab”. Bearing some surface visual similarity to the heavy artillery AT-AP pod walker, the AT-ME was designed for close-range combat, where its heavy armour, high-power lasers and medium antipersonnel blasters could be utilised effectively without the need to stop, position a supporting leg and fire the heavy mass driver of the AT-AP. With four short legs rather than the three longer ones of the AT-AP, the AT-ME was slower than the artillery walker but had better endurance and did not need to keep stopping. 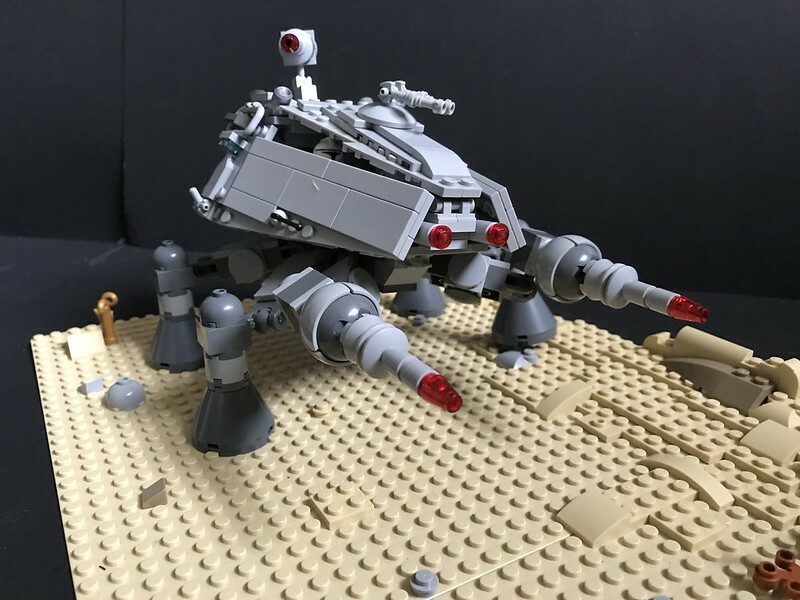 Two of the primary laser cannon armament were emplaced in movable pods forward of the four legs, giving the walker a crablike appearance and earning it its “Battlecrab” nickname. 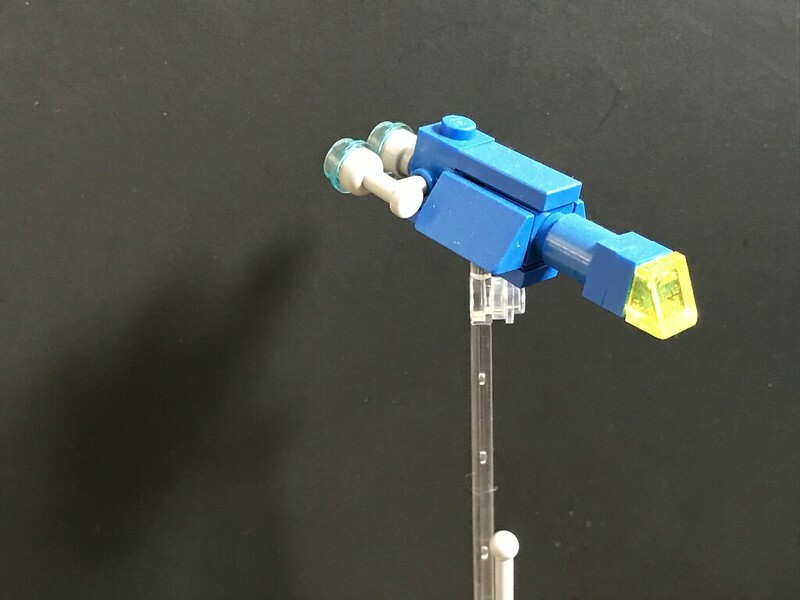 The third, slightly smaller primary beam was located in a scorpion tail-like appendage attached dorsally, while two forward-firing secondary beams and a pair of antipersonnel blasters pintle mounted to the roof completed the AT-ME’s armament. 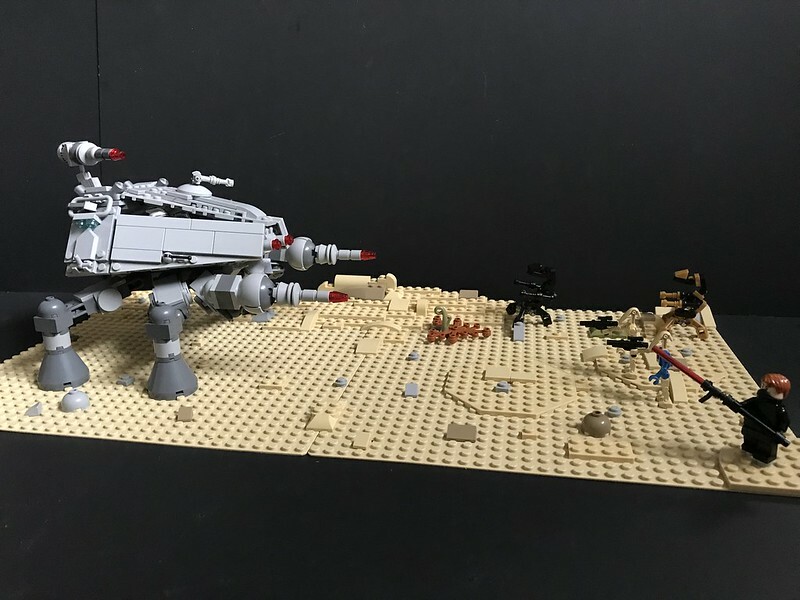 Despite surface appearances, the hulls of the AT-AP and AT-ME walkers were not identical and the two vehicles could not use one another’s hull plating in their construction. Seen here in operation on Tatooine against a group of Separatist battle droids led by the fallen Jedi calling himself Darth Maraud, the AT-ME is more than a match for over twenty times this number of battle droids, but against a full-blown Dark Jedi with Sith training, the battle is more evenly matched. 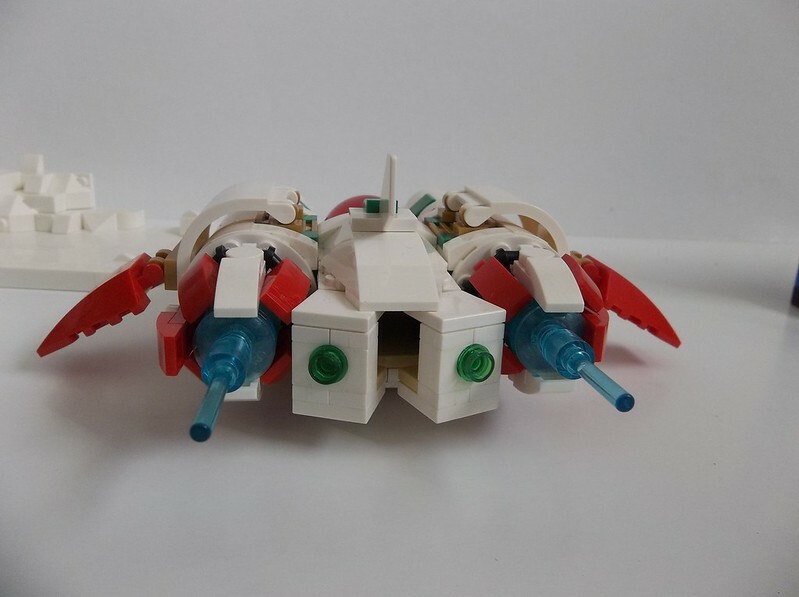 I’m not a great Star Wars builder, and even less so a builder of Clone Wars-era hardware. 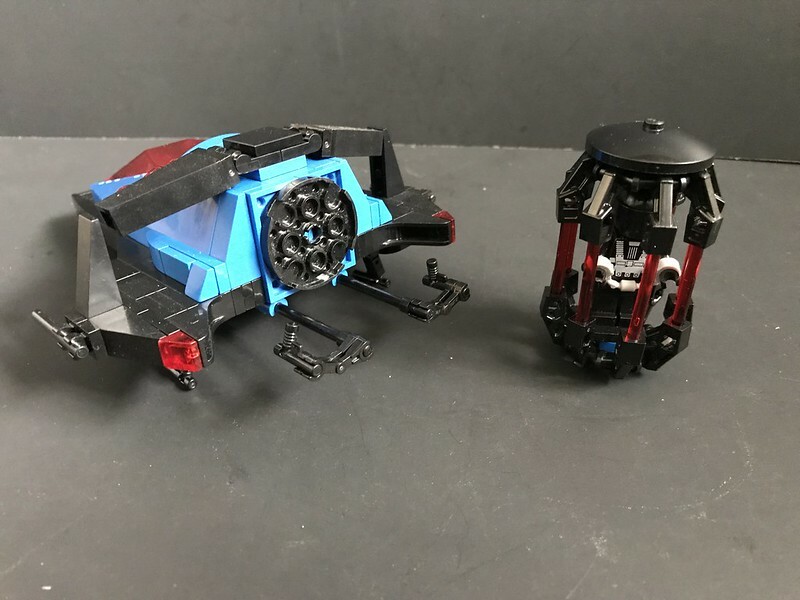 We have precisely two Trade Federation battle droids in our household inventory, and the same number of first-generation clone troopers, and while I like the look of some of the Clone hardware of that era, (AT-TE, Jedi interceptor, Count Dooku’s ship), other hardware is weird and ungainly-looking (Republic gunships, AT-TE transporters, Hailfire droid tanks). 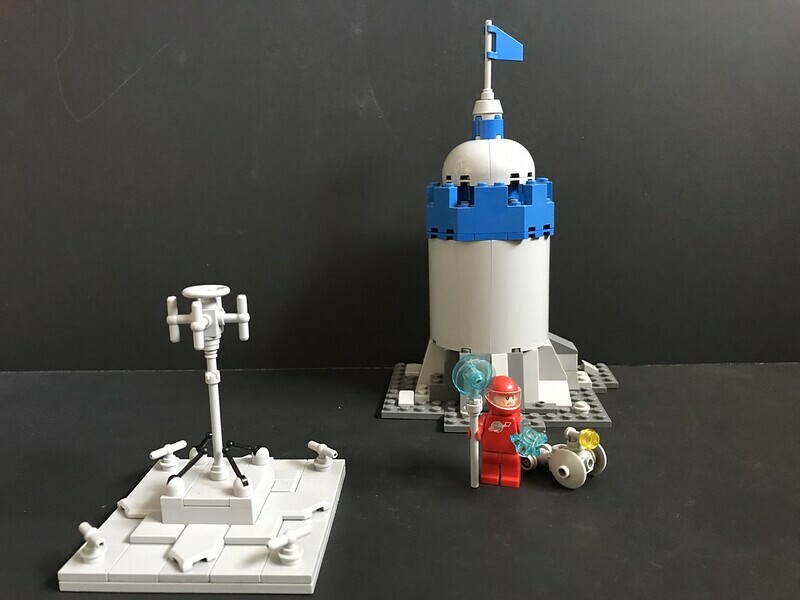 So this build started out being crewed by a couple of Classic astronauts. 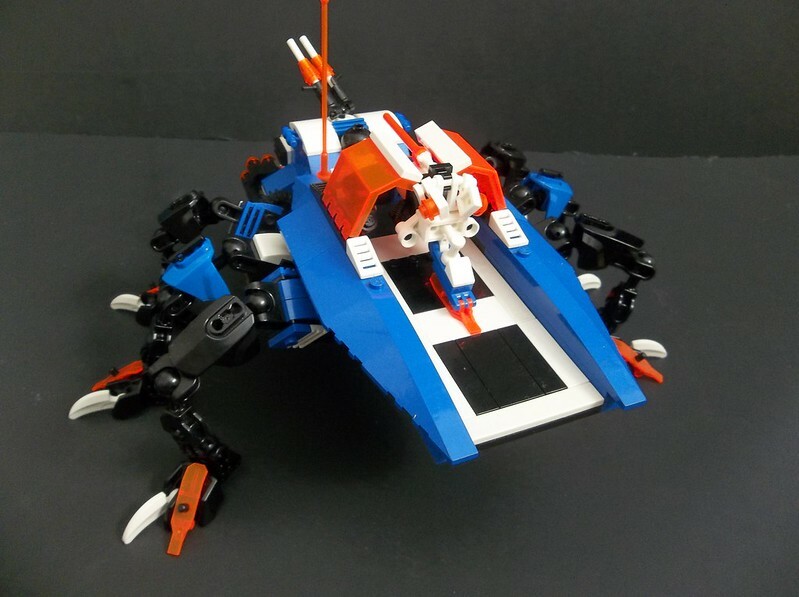 It works as a Classic Space battlemech, but I kept looking at it and thinking: “You know, this would be much better with clone troopers”. I was right; it does. And then, of course, I had to reassemble our battle droids as an opponent, and build a couple of droidekas, and then I couldn’t resist adding my Sith mini-me Darth Maraud. 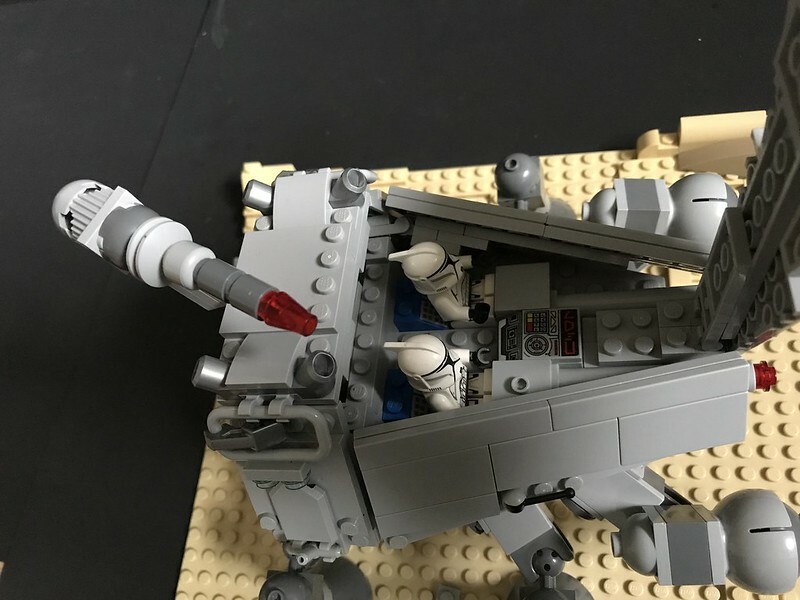 Droidekas are awesome, and I’ve never really felt comfortable with the scale discrepancies involved in the standard LEGO version, so I decided to build my own. 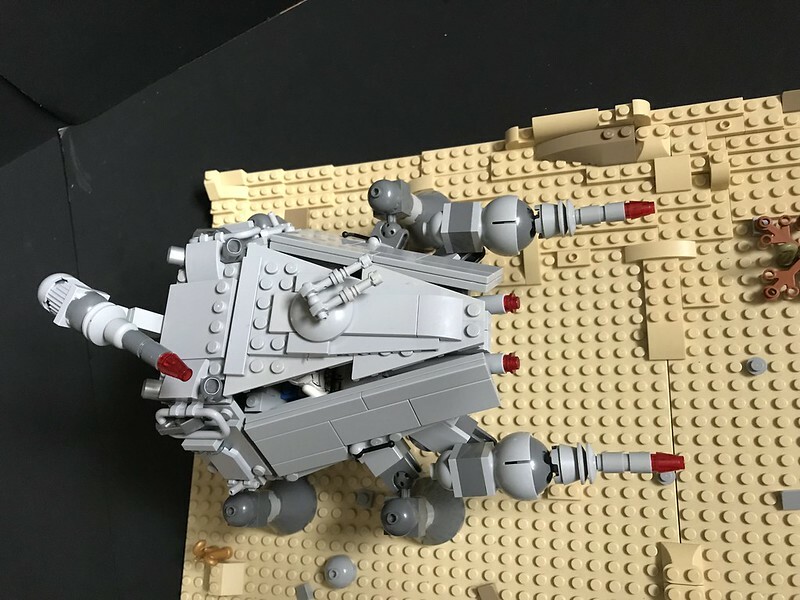 The legs are a little bulky for droidekas (maybe they’re an experimental sand version?) but they seem much more like they’re at a proper scale. They took several tries over two or three days to get right, but I think they’re as good as they’re going to get. Darth Maraud is my own Sith character. Technically, he ought to be a Dark Jedi and not use the Darth title, because of the strange Rule of Two that the Sith operate under in this time period. But I like the Darth title, so I’m twisting the canon into the usual pretzel shape invoked to clear any weirdnesses that contradict its diktats. In this particular case, I’m saying that he was originally a Jedi who became disgusted with the injustices and bureaucracy of the Republic and the perception of political manipulation by the Jedi Council and secretly turned his back on the Jedi Order. Discovering ancient Sith manuscripts in the Archives (placed there to prevent them seeding Sith sentiment in the wider populace), he renounced the Order, swore allegiance to the Sith and took the name Darth Maraud. Fleeing to the Confederacy, he was most probably killed in one of the many battles of the Clone Wars. 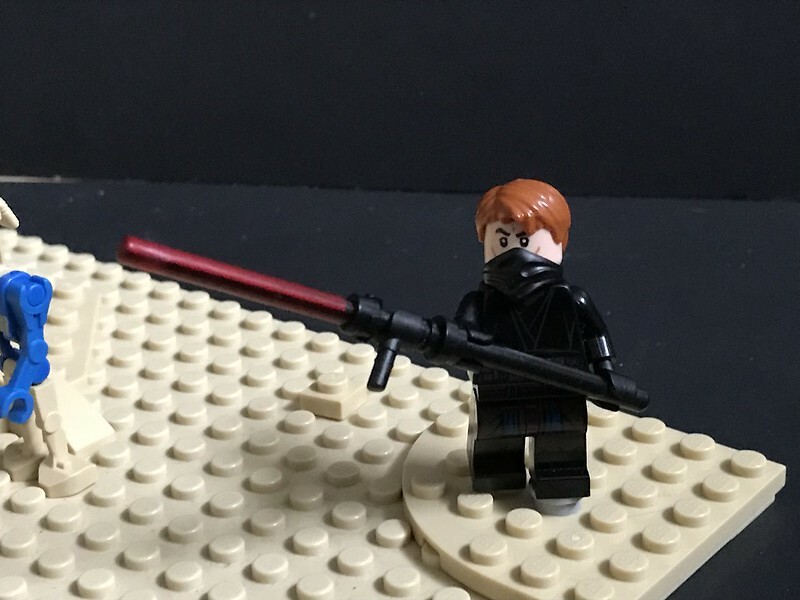 Following the Sith tradition of having interesting lightsaber designs, Darth Maraud’s lightsaber is based on a glaive-like polearm design which is probably a little unwieldy in a real fight against someone who’d fought against one before, but would have the advantage that its moves and techniques would be unfamiliar to your average standard saber-wielding Jedi. Also, it’s got a reach that dramatically outranges a standard lightsaber, which is always a plus. 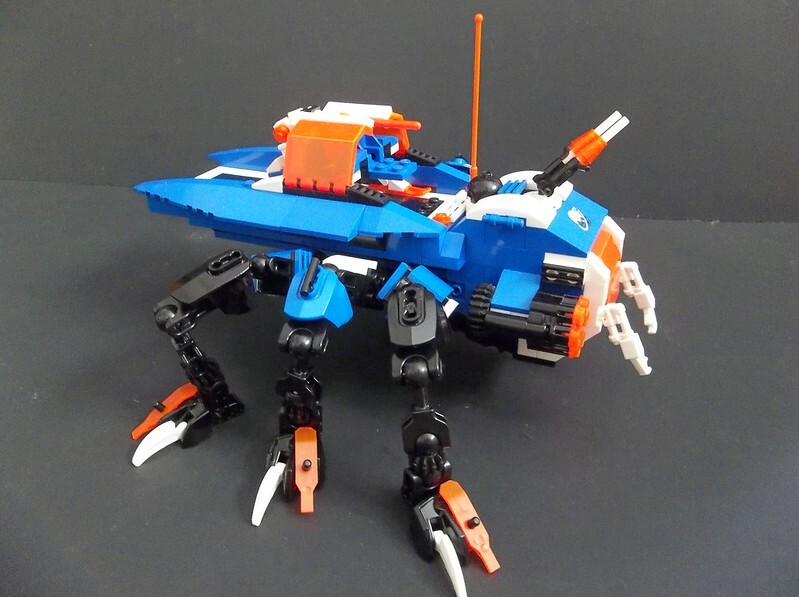 And since I’m calling the Clone walker the “All Terrain Medium Enforcer”, “eAT-ME” seemed like the perfect post title. 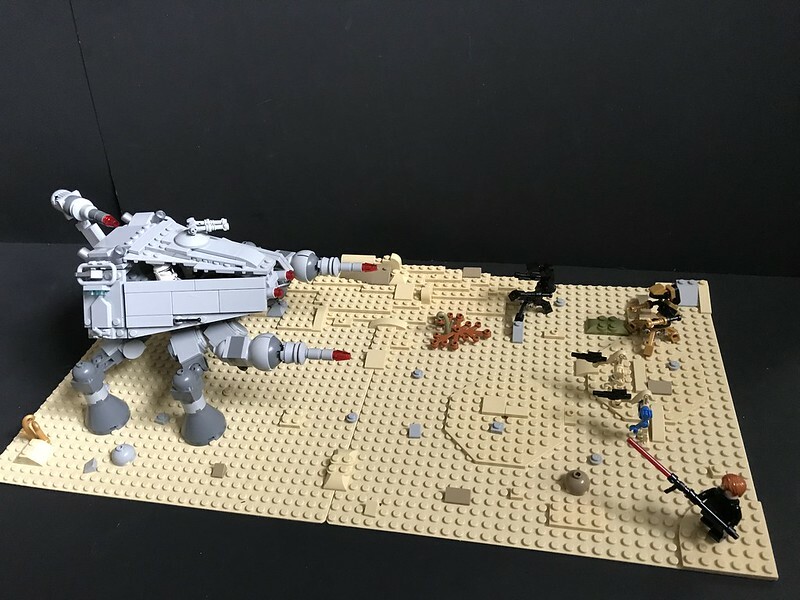 This entry was posted in Lego Space, LEGO Star Wars, Mechs and tagged Clone Walker, Clone Wars, Droideka, Lego, LEGO Star Wars, MOC, Sith, Star Wars, Walker on October 20, 2018 by geoffhorswood.